After the featureless desolation of the Skeleton Coast, entering Damaraland feels like emerging onto another planet. Under an improbably vivid sky, a prehistoric landscape of massive conical granite kopjies and mountaintops flattened by an eternity of erosion rises from barren gravel plains to an endless horizon. 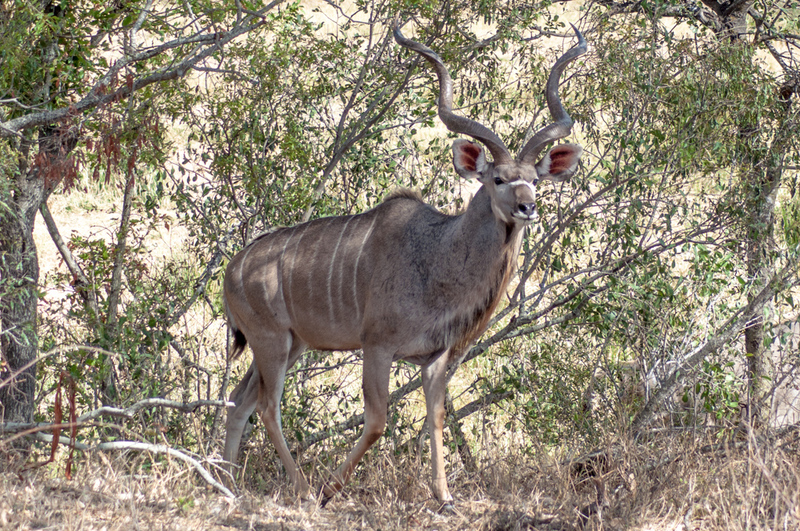 Kudus manage to exist on the sparse vegetation. Yet occasional patches of dusty vegetation hint at water somewhere below the parched ground. In a land that receives less than 150 millimeters (5.9 inches) of annual rainfall, and sometime none at all, camel thorn acacias outline the bed of an ephemeral river quickly absorbed into underground aquifers for storage. Beneath the trees, a family of kudus methodically munches on the sparse shrubbery. Further on, we come across clumps of euphorbia, their spindly grey stems toxic to all living things except oryx and rhinos. Then Jimmy Limbo, our outstanding Wilderness Safaris guide, points to something that has to be one of the most bizarre plants on the planet. The welwitschia plant traces back to Jurassic times. At first glance, it looks like an old tire blown to shreds, with rubbery red berries growing out of it. It’s the welwitschia, two strap-shaped leaves growing from a woody center (or caudex) to reach up to two meters (6.5 feet) in length. Like blades of grass, the leaves grow from the base, so that they can keep going even when their tip gets worn off. The oldest living specimens are estimated to be between 1,500 and 2,000 years old. Long before the plant, which traces back to the Jurassic period and is endemic to Damaraland, was “discovered” in 1859 by Friedrich Welwitsch, it was known as onvanga (desert onion) to the Herero people. The colossal sandstone ridges are ablaze in the setting sun. We have been driving for a couple of hours, Jimmy unerringly stirring our custom-built land cruiser through the unchartered immensity of a scenery that keeps getting ever more dramatic. The setting sun is turning the mountains into a colossal backdrop of burnished gold by the time we reach our small, semi-permanent private camp of domed tents tucked within the spectacular boulders of a sandstone ridge. After dinner, a braai (southern African barbecue) under a canopy of stars, a spectacular full moon rises, as if on cue, over the ridge. Angola giraffes have adapated to the arid rockly terrain. Morning comes early, and most of the day is spent bouncing on the back of the land cruiser, tracking rare desert-adapted elephants through an ever-changing scenery of rock and sand. Incredibly, this sun-baked land is able to sustain small populations of creatures who have adapted their life-style to survive in these almost waterless conditions. We sight small herds of springboks, oryx, ostriches and even the occasional zebra and giraffe, as well as desert squirrels and birds. The desert squirrel uses its bushy tail for shade. The elephants, although they have left a number of clues of their recent passage, keep eluding us. These pachyderms, who can travel up to 70 kilometers (over 40 miles) per day in their quest for food and water, seem to have headed for the hills. But Jimmy will not be stymied. We follow their uphill tracks onto a rocky terrain that lends a whole new meaning to off-road driving, to the base of a ridge where we abandon the car. It’s on foot from here on. I stumble my way to the top in his wake. 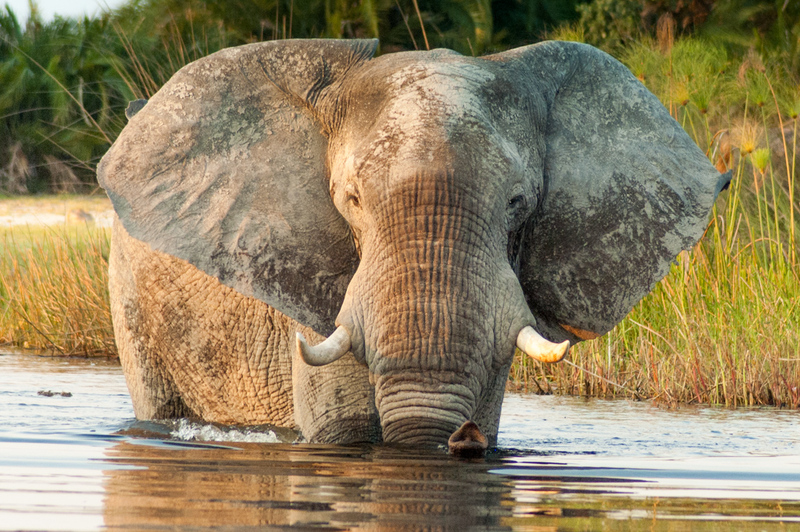 Desert elephants are constantly on the move in seach of water. By the time I have caught my breath, a small line of elephants are moving toward us on the path below, three adults and three calves in various stages of maturity, bronzed with desert dust. Even from up here, they appear visibly leaner that their brethrens of the savannah, and with longer, thinner legs that enable them to travel long distances to reach a water source. They browse sparingly, without tearing off the trees like elephants living in higher rainfall areas. From our perch, we observe them for some time in detail, until they continue on their ponderous way up and vanish over the opposite ridge. The sandstone valley of Twyfelfontein holds one of the largest concentration of petroglyphs in Africa. The next day, we visit Twyfelfontein (or Uncertain Spring in Afrikaans), so named by a settler, David Levine, who bough land there in 1948 in hope that the spring on the property would provide sufficient water for his family and livestock. Today, the name, along with a couple of crumbling walls from his tiny homestead, are all that remain from his twelve-year experiment. The engravings include a diversity of animals and foot prints. However, the Twyfelfontein valley, has been inhabited by Stone-age hunter-gatherers, the first Damara people, since approximately 6,000 years ago. Then 2,000 to 2,500 years ago came the Khoikhoi herders, an ethnic group related to the San (Bushmen). Both groups used the valley, then known under its Damara name of |Ui-||Aes (or jumping waterhole in Bushmen click language), as a place of worship to conduct their chamanist rituals. On the slopes of the sandstone table mountain that flanks the valley, these early Damara left us one of the largest concentration of petroglyphs (rock engravings) in Africa. All are chiseled in exposed locations on the massive rock face of free-standing boulders. The Khoikhoi also produced some rock engravings that can be clearly differentiated from the earlier ones. In all, over 2500 engravings have been identified so far, making the valley one of the oldest and most important open-air art galleries in Africa. UNESCO declared Twyfelfontein a World Heritage Site in 2007. Twyfelfontein’s most intriguing figure is known as the Lion Man. The images depict an astonishing diversity of animals, elephants, rhinos, giraffes, oryx , kudus, zebras and more, as well as foot prints. There are also a few instances of animals that do not occur in the area, such as seals and flamingos. Did some of these hunter-gatherers come from the coastal area more than 100 kilometers of arid desert away? Some graphics are also believed to be maps showing the location of waterholes. Originally, the theory was that people simply depicted what they saw around them and the game they hunted. Could they have also served an educational purpose? Today these engraving are thought to represent the transformation of humans into animals, an important aspect of the belief system and shamanist rituals of their authors. One of the most notable is the Lion Man. This lion is represented with a prey in his mouth, five toes on each foot (whereas lions only have four), and a very tall tail that ends with a six-toed footprint. Could this deliberate combination of human and animal features indicate that this shaman has transform into a lion? All these unanswered questions only add to the magic of Twyfelfontein. Twyfelfontein is easily accessible by road. From the main (paved) road C39 betweem Sesfontein and Khorixas, take the secondary (gravel) road D3214 for approximately 20 kilometers (12 miles) to the site. The visitor Center is open from 8:00 am to 5:00 pm daily, with last admission at 3:30 pm. The engravings can only be visited with a local guide following a predetermined itinerary. Admission is N$ 50, or approximately $ 4 US, guided tour included. Wilderness Safaris is a major ecotourism tour operator with a significant presence throughout eastern and southern Africa over the past three decades. They offer private access to some 2.5 million hectares (six million acres) of Africa’s finest wildlife and wilderness areas. While they do not take direct bookings, they work with a global network of destination specialists, including Wild about Africa, who I selected to arrange this journey around Namibia. Nestled in the heart of the famed 5,400 square kilometer (210 square mile) Timbavati Nature Reserve, one of the oldest and most pristine in South Africa, and with an unfenced border to the western boundary of the legendary Kruger National Park, Motswari Private Game Reserve is a safari-goers’ dream. It is teaming with the iconic Big Five (buffalo, elephant, leopard, lion and rhino) and a supporting cast of over 140 other mammals and 500 varieties of birds. 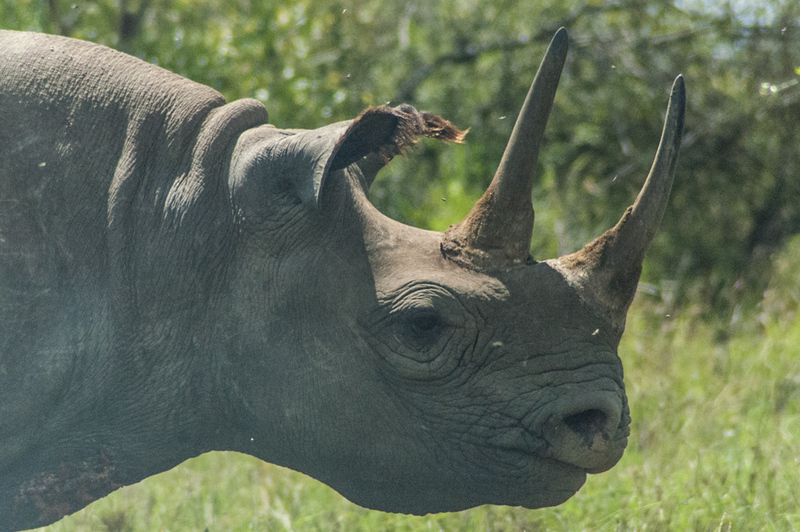 Motswari takes an active part in supporting rhino protection. In the local Tswana language, Motswari means “to conserve and protect.” Motswari Private Game Reserve has been living up to its name since the Geiger family acquired the property in 1992. From the onset, the original owner, the late Paul Geiger, focused on wildlife conservation, environmental management, and the creation of meaningful employment and growth opportunities for the local communities. The look of environmental protection excellence. On the public stage, this has earned Motswari an impressive number of prestigious accolades, including its on-going accreditation by Fair Trade in Tourism, South Africa (FTTSA), a distinction the property first earned in 2008. Motswari also achieved Gold Class status in 2013 on the Heritage Environmental Certification Program (based on internationally recognized sustainability and responsible business initiatives), making it the only environmentally certified lodge in Timbavati. What does this mean to me, the tourist? A lot actually. Beyond the personal satisfaction of knowing that my visit contributes in a small way to supporting a shared environmental and social ethos, choosing Motswari has a considerable positive impact on the quality of my safari experience. The first thing I notice as I settle in is the relaxed atmosphere of the property. The décor, an unpretentious mix of comfortable rustic furniture, local safari antiques, crafts and random personal mementos, has the charm of a family country estate that has developed organically over time. The lounge and dining area open onto a free-form swimming pool overlooking the river and the bush beyond. There, as in the nearby library, intimate seating arrangements invite to settle in, chill out and enjoy the view. All the bungalows are named after bush animals. Mine is Duiker. My own bungalow is a light-filled circular space with large French doors that open onto a private terrace overlooking the dry riverbed. It is furnished in an uncluttered, retro-style mix of rustic wood and rattan furniture, with a sumptuously comfortable king-size bed swathed in mosquito netting taking pride of place. But nothing retro about the vast en-suite bathroom with its deep built-in bathtub and separate walk-in shower with rain showerhead and great water pressure. Or in the thoughtful details at my fingertips to ensure a comfortable stay, from quality biodegradable toiletries to electrical outlets conveniently fitted with universal adapters to accommodate North American and European plugs. Another detail that enhances the enjoyment of my safari is what is not found at Motswari. (Spoiler alert – here comes one of my pet peeves). There had been a trend in recent years for upscale properties to include such sophisticated urban amenities as elite spas, painstakingly curated antique artifacts boutiques or haute cuisine restaurants with pre-dinner visits to in-house wine cellars. The pool overlooks the bush. This is not to say that I don’t appreciate the occasional bit of over-the-top pampering, in its own time and place. In the bush, however, I find it an unwelcome distraction from my wilderness experience. On behalf of safari purists everywhere, thank you Motswari for keeping it authentic. In incorporating responsible tourism as a key principle in its operating philosophy since its inception, the property has created a close-knit community where some employees have been with the lodge all of their working life and others are now second generation staff members. 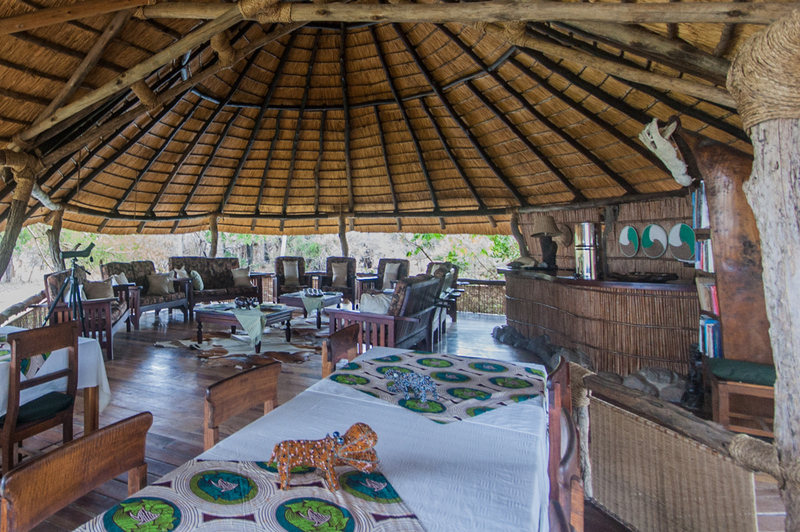 All are regarded as members of the extended Motswari family and feel enormous pride in their lodge. This is reflected in the positive way staff and management interact with each other and with the guests. I take with me warm memories of the genuine friendliness and concerted attention to details from the entire team to ensure that I enjoyed a memorable visit. Guiding excellence means repeated leopard sightings. The people factor is not just about superior service. It is inscribed in the success stories of staff members who, with management support, were inspired to follow their passion, and went on to raise the bar in their chosen field to deliver outstanding experiences for the guests. People like Godfrey Mathebula, the now Assistant General Manager, Motswari Private Game Reserve, who grew up on Java, Paul Geiger’s original property, where is parents were caretakers. This elusive male has concealed his kill high in a tree. The Geiger family supported him through school, then gave him a job in the maintenance workshop before his passion for the bush led him to the guiding field. After passing with a near perfect score the first level certification of the prestigious Field Guides Association of Southern Africa (FGSAS), he began guiding, went on to pass every level of certification available, become Motswari’s lead guide, and set a very high standard for every guide that followed. After the hunt, two lionesses groom each other. With the property’s privileged location at the unfenced edge of Kruger National Park, its 150 square kilometer (60 square mile) swath of traversing right within the game-rich Timbavati Nature and its long established wildlife conservation efforts, my guide could have ensured daily Big Five sighting with relatively little effort. But that’s not the Motswari way. Less than an hour into my first drive I am reminded that regardless of the abundance of game and birdlife, it is the guiding team that ultimately makes the difference between routine game viewing and an unforgettable experience. A male lion and his buffalo kill. My guide and tracker are among the best I have come across anywhere. With them every drive is a front row seat to the ever-unfolding drama of the African wilderness. We track through dense bush a leopard stealthily returning to the tree where it has concealed its fresh impala kill. We witness a territorial dust off between two males leopards, so sudden that the pursued has literally propelled itself to the top of a 20 meter (65 foot) yellow acacia by the time we spot its discomfited pursuer. An elephant cow and two calves. We observe at close range the dynamics between two male lions feeding on the carcass of a young buffalo, and lionesses and cubs from a resident pride grooming off each other the traces of a recent kill. Then there are elephants, large breeding herds of them on the move with their nursing calves, mud-encrusted rhinos crashing their way out of a waterhole, and cheetahs on the prowl. When we eventually return to the lodge, still buzzing from the experiences of the past few hours, it is to sumptuous brunches cooked to order or to formally served dinner or braai (South African barbecue) around the boma’s central fire pit. Teatime is announced with a song. Meals are a never-ending feast here. And another Motswari people success story. Young Grace Mnisi discovered her passion for cooking when she joined the kitchen staff as a kitchen assistant right after school in 1996. She steadily worked her way through the ranks to pastry chef and sous-chef and finally head chef in 2004. Along the way she has ranked for Best Food among the top lodges in the country in national Bush Banquets competition and even found the time to earn herself a Professional Chef college certification. Today, Amazing Grace, as Chef Mnisi is often called, and her kitchen team treat the guests throughout the day to imaginative meals beautifully prepared from fresh local products. Her cuisine focuses on South African specialties with subtle international accents. Dinner is served around the fire under the stars. For three decades now the owners of Motswari have managed the property according to principles that would later be summarized in the 2002 Cape Town Declaration on Responsible Tourism as caring for the wildlife, the land and the local community to “create better places to live in and to visit”. Thank you to everyone in the extended Motswari family for making it one of my best safari experiences ever. Motswari has been owned by the Geiger family for two generations. Current owner is Marion Geiger. The property is managed by Newmark Hotels, Reserves and Lodges. Motswari Private Game Reserve. motswari.co.za e-mail: reception@motswari.co.za or reservations@motswari.co.za. Or call: + 27 (0) 21 427 5900. It is a six-hour drive from Johannesburg or 75 minutes from Hoedspruit Eastgate Airport . Accommodations consist of 15 bungalows that can welcome a total of 30 guests. Complimentary WiFi service is available throughout the day and evening in the public areas. First designated as a protected area in 1898, Kruger National Park became South Africa’s first national park in 1926. It is also one of the largest, covering an area of 19,485 square kilometers (7,523 square miles) in the northeastern corner of the country. Two dozen private reserves that share an open border with the western boundary of the park contribute an added 18,000 square kilometers (700 square miles) of unfenced land dedicated to conservation where the rich game population of the overall Kruger area can roam at will. Collectively known as the Greater Kruger National Park, these private reserves are home to a number of upscale lodges ruled by charters that strictly limit the number of guests and game viewing vehicles allowed on their land to ensure that their guests enjoy an optimum game viewing experience as well as activities such as nature walks as well as off-road and night drives that are not allowed within the boundaries of the Kruger National Park. Like most visitors to Malawi, the small landlocked country wedged into the southern end of the East African Rift Valley, I was drawn there by its eponymous lake. But beyond the shores of the dazzling “Lake of Stars”, I discovered an endearing little country with exciting, if limited wildlife viewing opportunities. 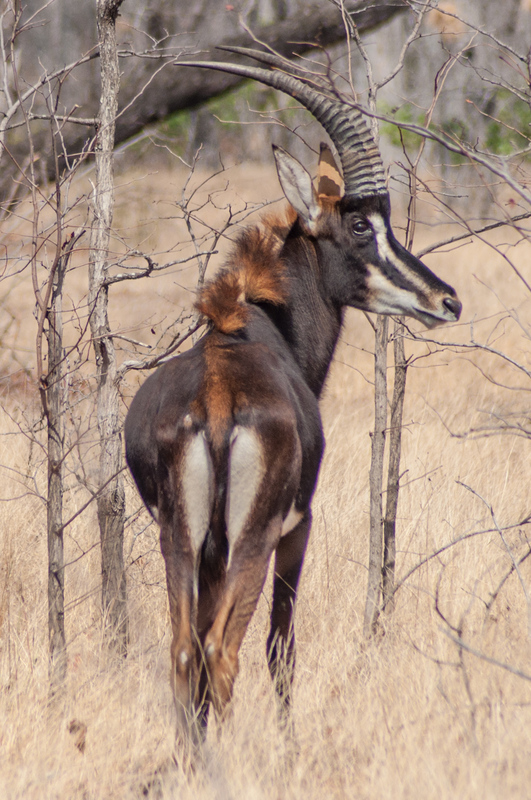 An elusive Sable Antelope sighting in Liwonde. Located in the Upper Shire Valley, the 580-square kilometer (220-square mile) Liwonde National Park is considered the premier wildlife-viewing destination in Malawi. It stretches along the left bank of the Shire River, the only outlet of Lake Malawi and the largest river in the country, on its 400-kilometer (250-mile) way to the Zambezi River in Mozambique. By far the main attraction of the park, the river allows it to support one of the densest populations of elephants and hippos in Africa (about 900 and 2000 respectively). Liwonde is also known for its abundance of birdlife and due to the absence of major predators, it is home to a good a variety of antelopes. It’s where, after five previous trips to some of the most vaunted safari destinations in Africa, I have the pleasure to finally encounter sable antelopes. It’s a solid two-and-a-half hour drive from Blantyre, southern Malawi’s major city and airport, to the Western gate of the park. The paved road becomes gradually less so as we get farther away from the city. It disappears entirely as soon as we get off the main north-south thoroughfare. It’s all rocky dirt roads from here on, lined with tiny brick homes covered with disheveled thatch, each sitting on its small patch of ground. My driver drops me off at the park’s gate where my arrival is duly recorded and announced by phone to the Mvuu Lodge. 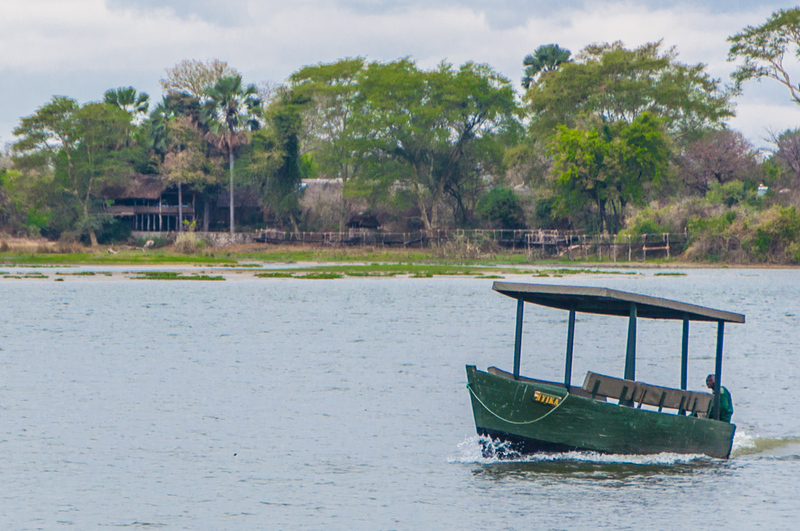 It’s a short boat across the lagoon to Mvuu Lodge. Ideally located at the edge of a secluded lagoon across the Shire River from the park entrance and the only property inside the park, the Mvuu Lodge can be reached only by boat. It is so well integrated into the dense grove of yellow acacias that I don’t notice any sign of human habitation at first; until a small wooden craft detaches itself from a spindly dock and chugs its way across to collect me. The lodge immediately lives up to its name (Mvuu means hippopotamus in the local Tonga language). 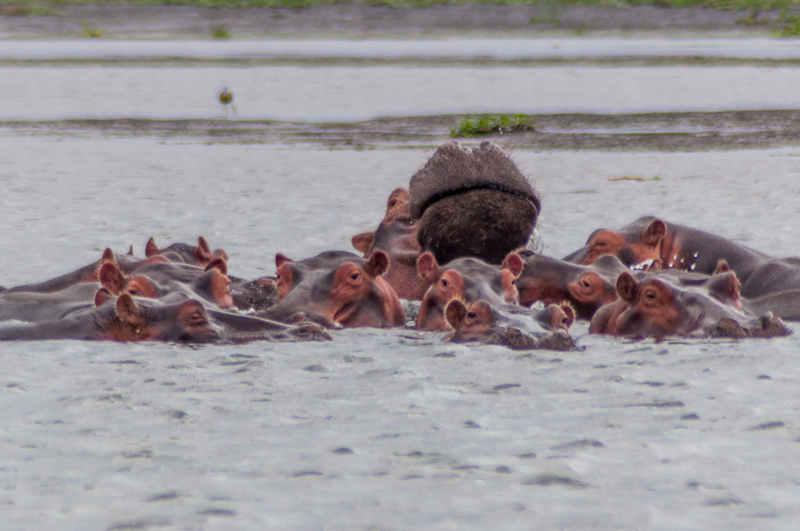 We zig-zag our way across the lagoon, giving a wide berth to pods of hippos submerged save for dozens of periscope eyes that follow our progress with a baleful gaze. 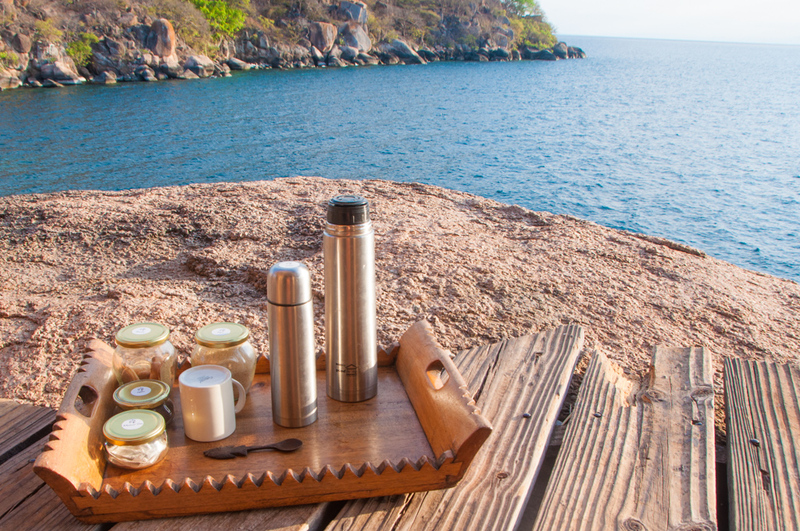 Mvuu is an upscale, environmentally-friendly wilderness lodge with a casual atmosphere and an attentive, friendly staff. Raised high into the trees, the open-sided thatched main lodge provides an perfect hide-like retreat to observe the constant activity of the lagoon. The Shire River is home to a large colony of crocodiles. In addition to its many hippos, it is home to a large resident family of warthogs and a colony of seriously oversized crocodiles. A late model telescope on a tripod invite guests to take a closer look at the birds that fill the trees all around. A male kudu in the brush by the river. The riverside location allows for a mix of cruises and drives that provide a close and varied view of the game as it goes about its daily life. 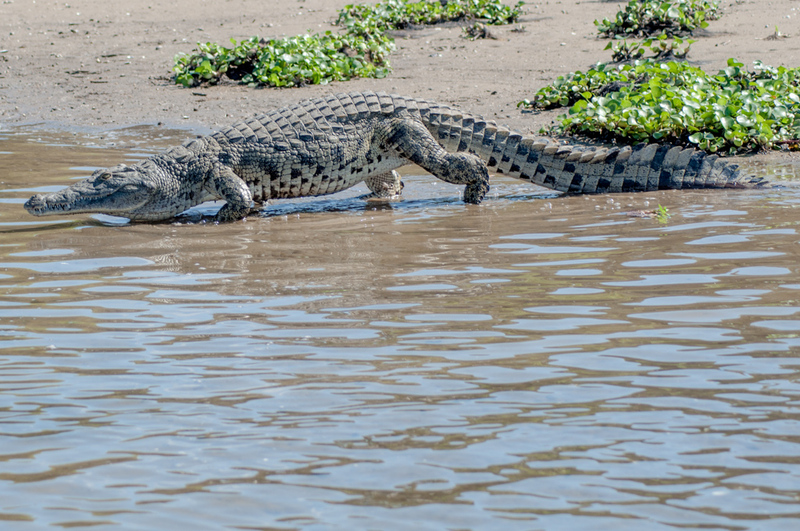 Game-viewing is generally interesting at Mvuu but never more so than on the river. An especially memorable morning begins as a typical pleasant boat ride punctuated by a steady stream of photo opportunities of the waterfowl and raptor population, various antelopes coming to the water and a small breeding herd of elephants wading across in the distance. A “big tusker” snoozes by the water. 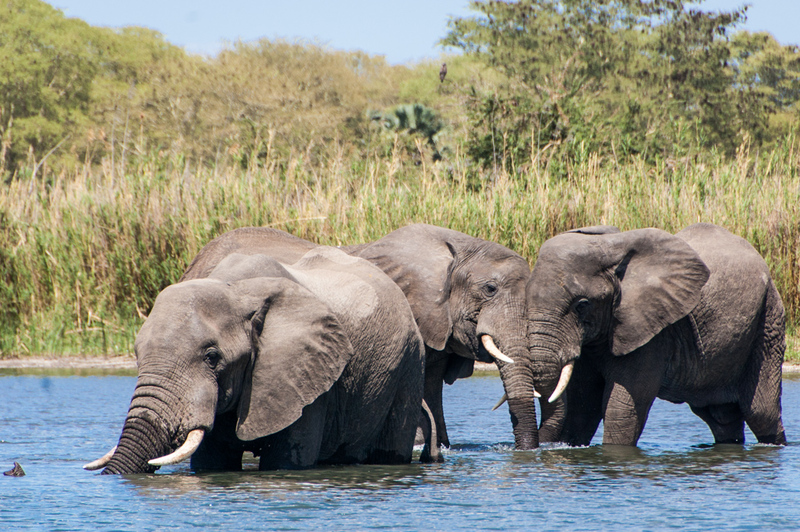 We then come upon a few venerable “big tusker” bull elephants lined along shore, dousing themselves by the trunkfull with river water. I spot one of them snoozing at the edge of a wall of savannah grass. Yes, elephants do sleep lying down. I can hear his stentorian snore drift toward me. Suddenly several more begin to emerge from the grass and congregate on the shore. The snorer stretches awake. Come on in, the water is fine. After a half hour of what looks like a palaver to weigh in the advisability of going in for a bath and considerable testing of the waters by various parties, they all wade in over time. What follows is a “horsing around” session of epic proportions, with these grizzled behemoths splashing and dunking each other under the waterline before rearing back up like teenagers at the beach. Liwonde elephants at play in the Shire River. It is this spectacular encounter with that I take with me at as the iconic memory of my visit to the Mvuu Lodge. Mvuu Lodge opened in 1998. It is owned and managed by Central African Wilderness Safaris (CAWS), a Malawi company wholly owned by founders Chris and Pam Badger. Central African Wilderness Safaries, cawsmw.com/index.php/lodges/mvuu-lodge/, e-mail: info@cawsmw.com, or call: + 265 1771 393/153. Accommodations consist of eight spacious tents under thatch that can welcome a total of 16 guests. The tents are raised well above the ground on vast wooden platforms that include a wrap-around deck overlooking the bush. They are scattered along neat sandy paths at the rear of the lodge for complete privacy. Each tent has full bathroom facilities, including a shower with hot and cold running water and a flush toilet. There is solar power in the tents. Although lion tracks have been occasionally spotted and a male lion sighting reported recently, I didn’t see any “big cats” during my stay. But in addition to the large and active population of elephants, I found the abundance of antelopes, the excellent bird-watching opportunities and the warm Mvuu hospitality well worth my visit. My friends had a lot of questions when I mentioned I was on my way to Malawi. The most frequent was: Where? No surprise, since I too had to look it up when I first heard of the small landlocked country wedged into the East African Rift Valley system. It’s easily missed on the map of Africa, overshadowed by its much larger and better-known neighbors Tanzania to the North, Mozambique to the east and south, and Zambia to west. It is also one of the poorest countries on the planet and one the least developed in Africa, with only the most rudimentary national infrastructure and thus mainly overlooked by tourists. The only one who expressed enthusiasm was an avid diver: “You are going to The Lake!” he exclaimed with a hint of envy. 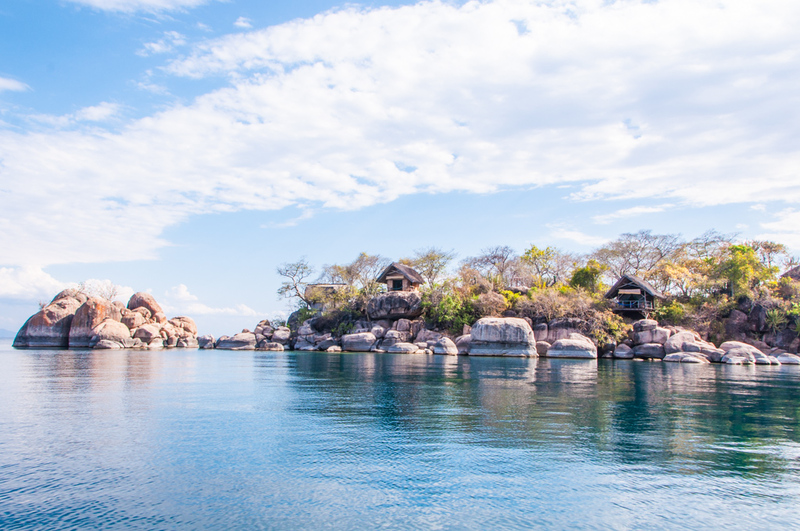 The third largest of the great East African lakes, some 580 kilometer (360 mile) long and 75 kilometer (46 mile) wide, Lake Malawi is the main topographic icon of the country. But rather than its size, its pristine shores and deserted islands of towering boulders rising from crystal clear waters alive with small brightly colored fish are what earned its international renown among water sports enthusiasts and naturalists. 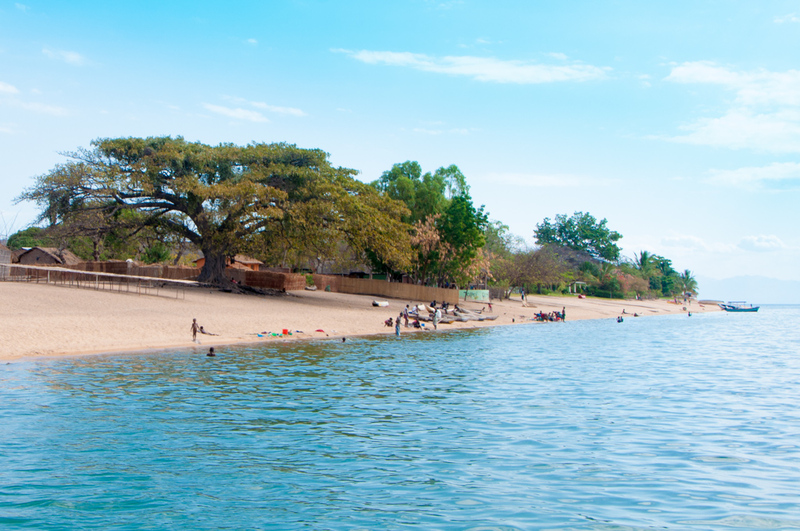 It was these hundreds of endemic species of cichlids as well as the beauty of the scenery that drove the Malawi government to set aside the southern end the lake as Lake Malawi National Park in 1980 making it the first fresh water marine reserve in the world. It subsequently became a UNESCO World Heritage Site in 1984. My driver drops me off by a sundrenched beach, deserted except of the representative of Kayak Africa here to welcome me, and a cluster of half-naked kids frolicking in the gentle surf. 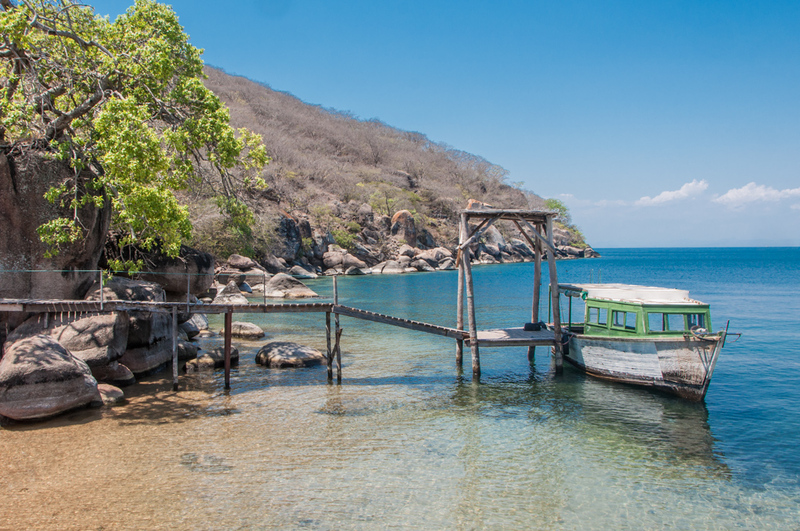 I am in Cape Maclear on the southern shore of Lake Malawi. A brave little wooden boat bobs at the end of a precarious jetty, the name Feersum Endjinn carved in its weathered bow. Thus reassured, I take the extended hand of the pilot and come aboard. 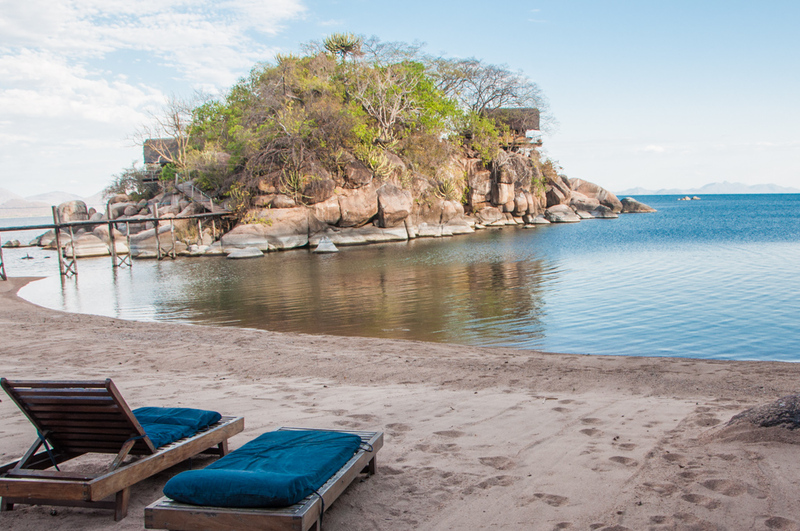 It’s an hour’s ride to Mumbo Island, one square kilometer (250 acres) of granitic rock topped by lush miombo woodland located ten kilometers (six miles) off shore in the heart of the 9,400 hectare (36 square mile) Lake Malawi National park. At first glance it looks just like another of the rocky dots rising out of the shimmering water that we’ve whizzed by along the way. But as we draw closer, tiny reed and thatch chalets barely distinguishable from the tangle of trees begin to materialize; then a small crescent beach of golden sand. The camp is located on two islands. The dining room, lounge and tiny gift shop hut sit just above the beach on the main island. Meanwhile, a long footbridge leads to a promontory of giant boulders jutting into the lake, where guest bungalows are perched high in the rocks to better admire the dazzling waters of the lake. This is off-the-grid living at its magical best. 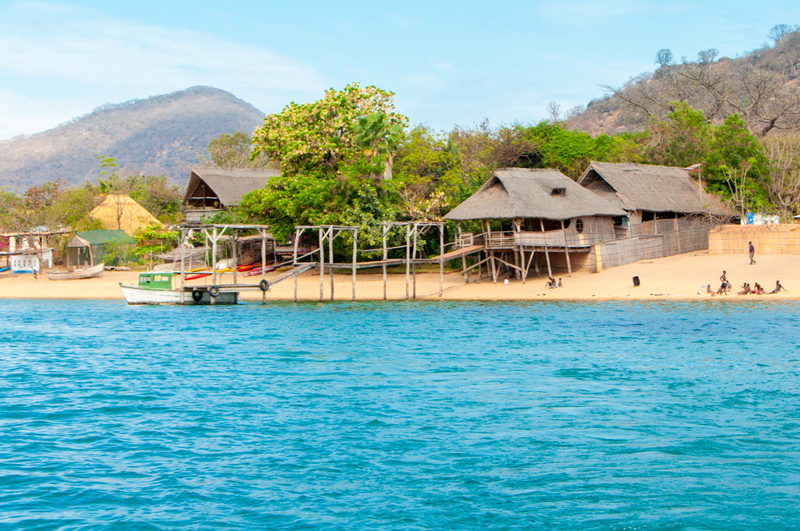 Until Kayak Africa was first award the exclusive rights to operate tourism accommodations on Mumbo Island in 1996, it had never been populated. To preserve the primeval beauty of its unique lake setting, the company’s founders Clive Bester and Jurie Shoeman created a minimalist property based on uncompromising sustainable principles. 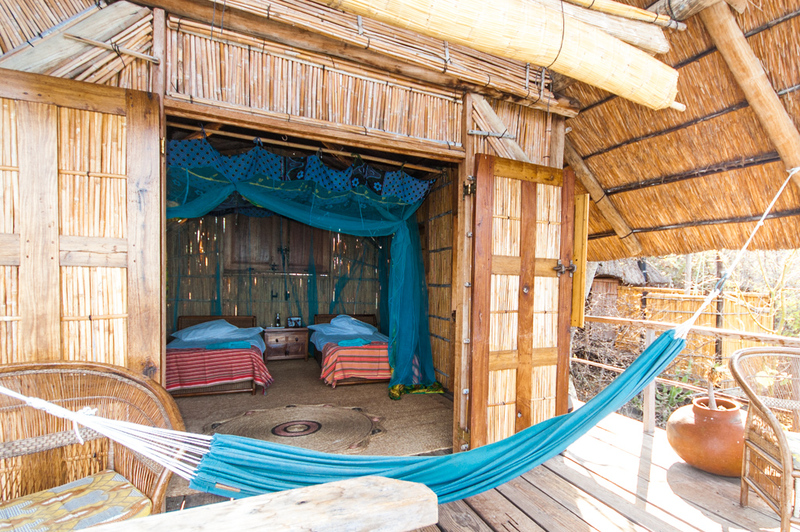 Rustic bungalows of reed and thatch, comfortable beds swathed in mosquito nets, bucket showers and “eco-loos” and a dining area that serves wholesome, simple foods. In a corner of the beach, a water sports gazebo has snorkeling equipment and kayaks at the ready. There is no electricity, just solar and paraffin lamps and wind up flashlights. In his remote haven, life naturally falls into the eternal rhythms of the sun and the moon. 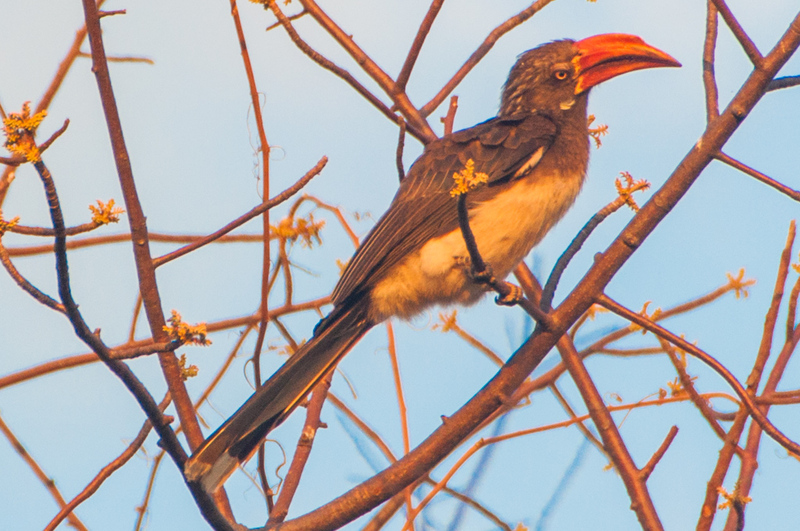 My days begin at dawn with a wakeup call from a red-billed hornbill enthusiastically welcoming the new day in a tree above my head. I move from my bed to the hammock on my deck to contemplate the blood-orange sunrise slowly morphing into a clear morning while small boats dart across the lake after a night of fishing. By now a tray laden with tea and cookies has materialized at the corner of my bungalow. When I finally stir I head for the dining room where a hearty breakfast await. I pause on the footbridge to take in the bright kayaks lined up at the edge of the beach and the crystal waves lapping at the freshly swept sand. Another day in Eden has begun. After a day of snorkeling among the cichlids, the colorful small fish than have evolved into hundreds of varieties for which the lake is famous, or blissfully whiling away hours with a book in my hammock, it’s time to enjoy the sunset. Boatswain Owen takes me around the island to the ultimate sunset viewing spot where we watch the sky turn into surreal shades of bronze to crimson to purple before fading to dark. After an unpretentious meal by the soft glow of the paraffin lanterns, I return to my bungalow and settle on what I will forever think of as “My Rock” still warm from the day’s sun. Millions of diamond-bright stars pierce the velvet sky. The horizon is outlined by the myriad pinpoint lights of the hurricane lights fishermen use to lure fish into their nets. I send a mental nod or understanding to nineteenth century English missionary explorer David Livingston who gave the place its moniker of Lake of Stars. Kayak Africa is a South Africa based company that has been operating Mumbo Island since its inception in 1996. Kayak Africa, kayakafrica.co.za, email: letsgo@kayakafrica.co.za, or call + 27 (0) 21 783 1955. There is no electricity on Mumbo Island. Any battery operated equipment can be sent overnight to the mainland for charging. 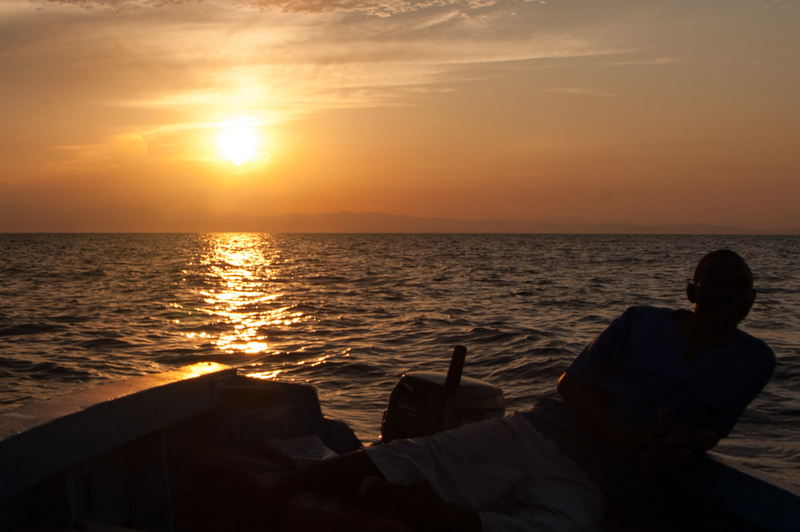 There is a daily boat connection between the island the Kayak Africa office in Maclear. Getting to Malawi requires flying via Nairobi, Kenya or Johannesburg, South Africa. There are connecting flights from Kenya Airways and South African Airways respectively to the two major cities, Lilongwe and Blantyre. From either, road transfers can be arranged by Kayak Africa. 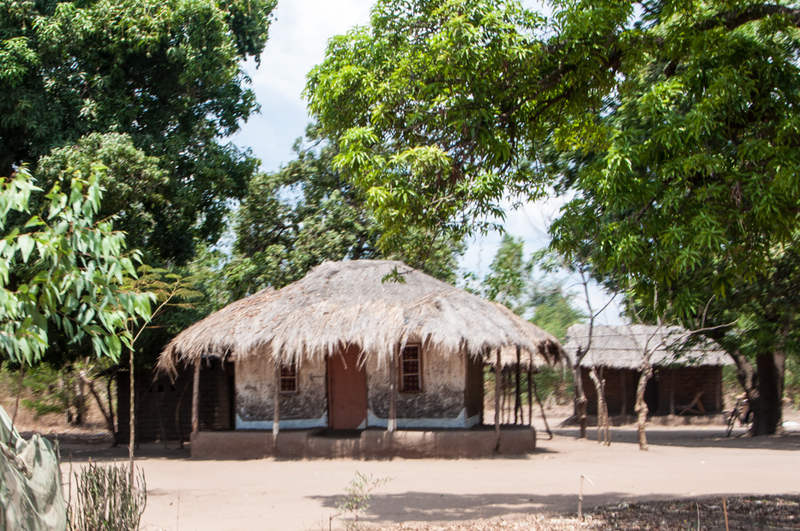 “Once the red dirt of Africa gets into your hiking boots, you will never get it out.” The place was Kuyenda, a tiny bush camp in the heart of Zambia’s remote South Luangwa National Park and the first stop on my first African safari. The year was 2006. The soft-spoken words came from a man who knew what he was talking about. 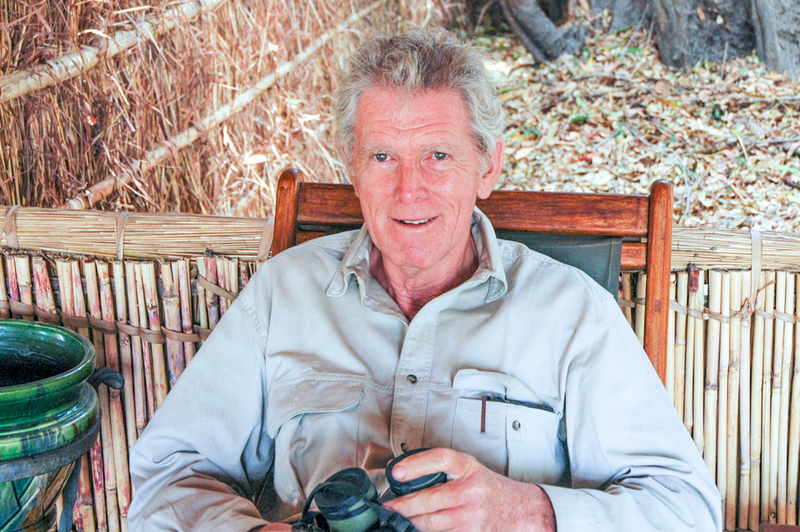 Phil Berry is one of the most respected naturalists in Zambia. Born in England, Phil Berry moved to Africa as a child and grew up in Northern Rhodesia before it became the Republic of Zambia in 1964. And there he was still, now a living legend well beyond the Luangwa Valley, for his life-long dedication to the protection of elephants and rhinos and as a pioneer of the walking safaris for which the park is famous. I nodded. I was still groggy from the 48-hour journey from North America but after one single day in the bush, I already understood. The day’s game drives had taken us from elephants tearing at Mopani trees for their breakfast and hills dotted with skittish impalas ready to bounce off at the first hint of menace to a pride of lions still sleeping off last night’s feast in a shady glade. Then there had been a intoxicating African sunset and a lovely al fresco dinner under the black velvet and diamonds sky. I was already hooked. In the highlands of Kenya, my first rhino sighting ever. It took three trips before I was finally able to sight a rhino; and a close up encounter it was. It was in the Ol Pejeta Conservancy the highlands of Central Kenya. My guide stopped our open land cruiser and pointed into the dense brush. “Rhino,” he whispered. I got so excited that I jumped up to stand on my seat and brace myself on the overhead roll bars, camera at the ready, thus forgetting one of the cardinal rules of game watching (no abrupt move). The startled black male rhino came charging out of the brush, coming straight at us before finally making a ninety degree turn a mere six feet from impact! This old bull stares us down and out of his watery kingdom. 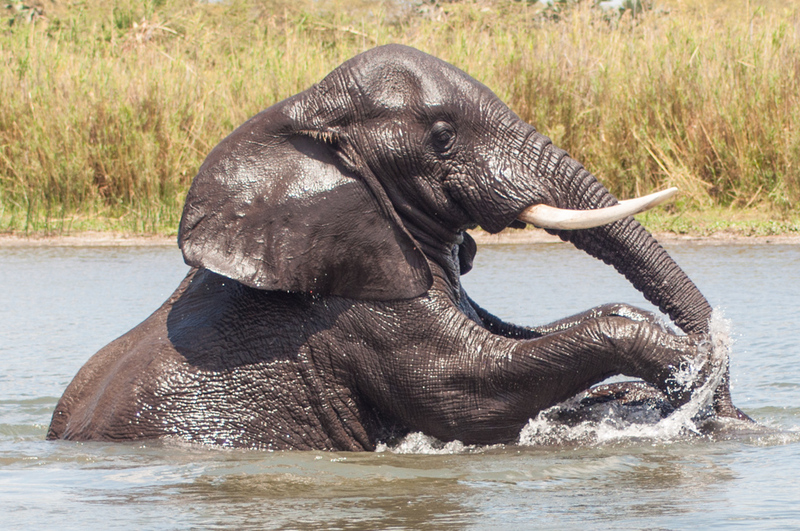 Who knew elephants could charge so fast in water? 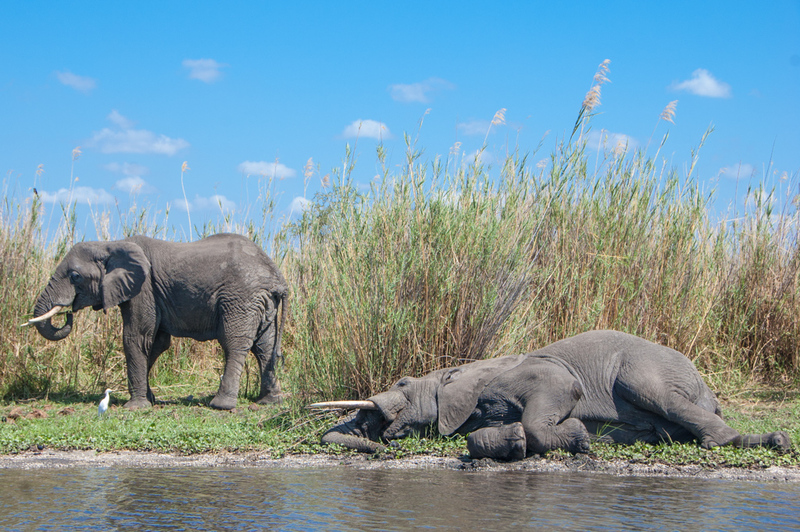 Also in the Okavango Delta, this large bull took exception to our boat navigating in “his” channel. He started menacingly toward us until we finally got the outboard motor into reverse. Newborn elephant learns how to nurse. 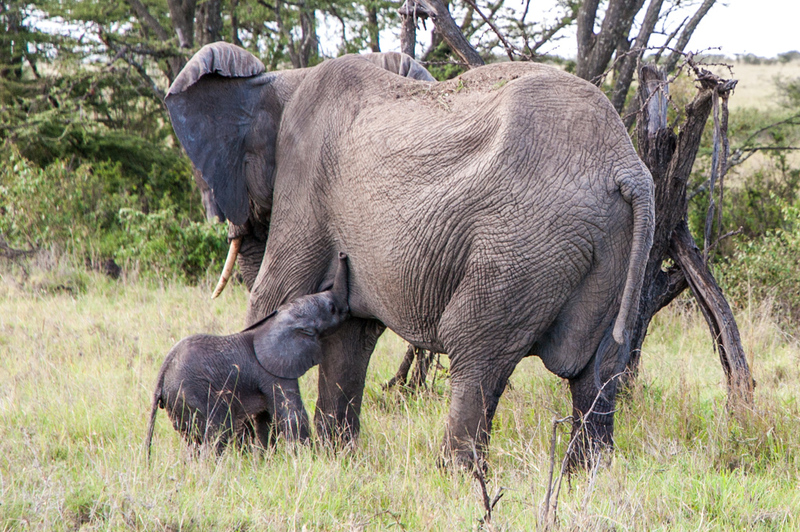 We came across this elephant cow in the Masai Mara National Reserve in western Kenya. She stood patiently while her hour-old calf tried to figure out what to do with its nasal appendage in order to start nursing. 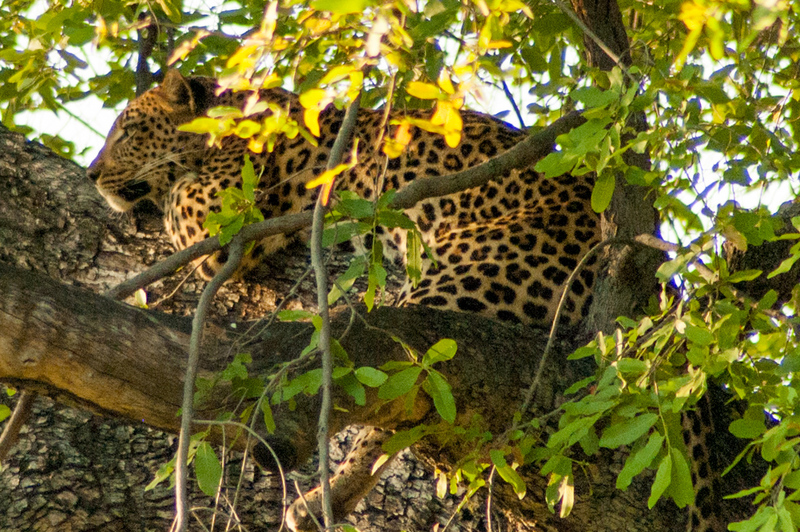 In Botswana, my first sighting ever of a leopard in a tree. While I had seen leopards on several occasions on previous trips, I didn’t get to observe one settled in a tree until my fourth visit to Africa. We were driving in the waterlogged world of Botswana’s Okavango Delta when my ranger pointed into the tree canopy right above our open vehicle. Lucky for us that this magnificent cat had obviously already enjoyed a large dinner. After a blood-curdling warning roar, this old timer resumed his benevolent attitude. We were settling in to enjoy our tailgate sundowner cocktails in a sandy clearing in Bostwana’s Kalahari when we heard a chilling moan nearby. It turned into a high-energy rumble, then escalated into a full-blown roar that made the air vibrate around us and my entire body shake. My guide calmly motioned to me to climb back into the cruiser. I certainly remembered the “no sudden move” rule this time! We then eased at very low speed in the direction of the roar. Having served us notice that we were trespassing, the old lion had resumed a deceivingly benevolent demeanor. My great Zu/hoasi Bushman guide, Cobra. In the Kalahari, Cobra, a Zu/’hoasi bushman elder, member of one of the oldest cultures on the planet took me on a desert nature walk. 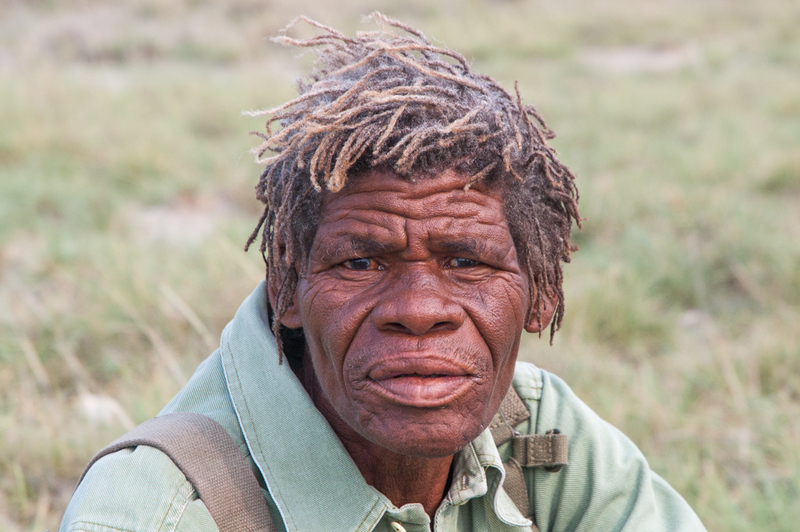 He mainly spoke the distinctive clicking language of the Kalahari Bushmen, but somehow we understood each other. 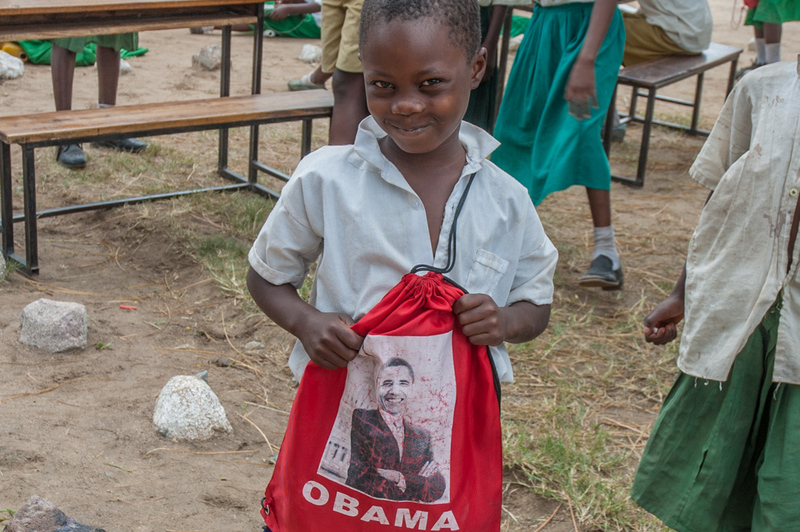 Masai first-grader and her prized book bag. In a country where the literacy rate for women is still only around fifty percent, I was delighted to meet this enthusiastic Masai first-grader at a charter school supported by andBeyond, the safari organization with which I was traveling through Northern Tanzania. She even let me admire her book bag, her proudest possession.